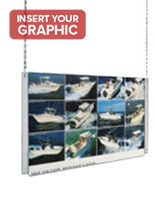 Hanging Poster Displays Holds 24" x 36"
These hanging poster displays come with a 24"w by 36"h non-glare acrylic frame reduces annoying light reflections for clearer view of posters. These sign hangers comes complete with hanging hardware kit for suspended ceilings that inlcudes two 10' lengths of chain, 4 S-hooks and ceiling clips (all metal). 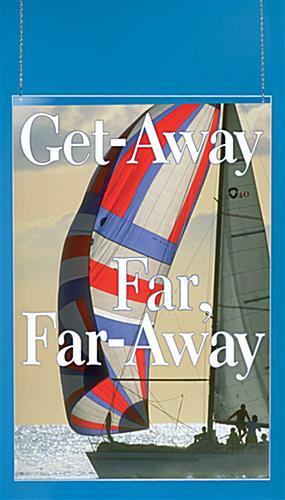 Posters can be inserted back-to-back for double-sided viewing. 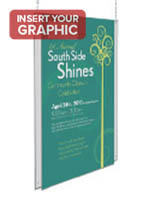 These hanging poster displays allow for more wall and floor space and does not occupy any valuable area. 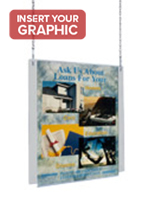 These sign hangers are an inexpensive way to advertise and promote your company. 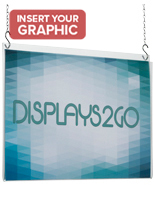 These hanging poster displays are ideal for customers that want to promote in a unique way. 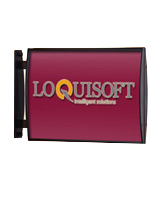 These sign hangers can display advertisements such as events, specials, sales, discounts and much more. The majority of these hanging poster displays are seen in retail stores, restaurants and other businesses that are currently changing their advertisements. Great product. 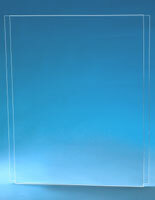 Simple, easy to hang, sturdy, and comes with everything I needed for an easy install.